Jenna Monroe has performed in Paris, Berlin, Belfast, the United States and widely across the UK from the Savoy in London to Gloucester Cathedral. Jenna Monroe, Rich with humour and pathos, Jenna takes her audience on a roller coaster journey through love, from the skewered (The Masochism Tango) to the sublime (Cohen's 'Hallelujah'). Also featured is the music of the Uppity Blues Women, Sondheim, Cole Porter & Gershwin. "Her rich, soulful voice conveys every shade of emotion..." Bath Chronicle. 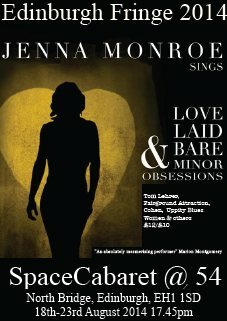 Jenna sings and plays her unique & sublime arrangements of some of Leonard Cohen's most well-loved songs. "A singer of terrific emotional power..." Gloucestershire Echo. "A heart stopping Hallelujah..." Stroud News & Journal. Jenna sings and plays her compelling & utterly contemporary arrangements of classic freedom songs (spirituals), given a permanent home in the Women In Jazz archives in Swansea. "She sang classic spirituals magnificently & to such effect that she should take this to as wide an audience as possible - a performance of power & passion..." Newbury Weekly News. 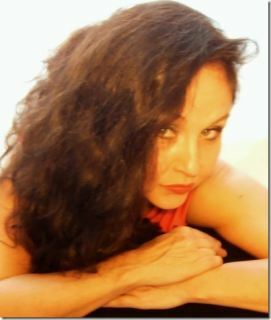 Jenna Monroe sings mellow classic jazz standards accompanied by pianist/composer/author, James D'Angelo, originally from New York. "An absolutely mesmerising performer" the late Marion Montgomery, jazz singer. "Absolutely fabulous" Daffodil Restaurant, Cheltenham. In a richly diverse programme, Jenna Monroe sings and plays across cultures: classic freedom songs (spirituals), British and American folk favourites, the sophisticated and sublime arrangements of Leonard Cohen's work and the simple, heartfelt songs of Emmylou Harris. Her warm, lyrical voice reflects this heritage of many colours in an inspiring performance that is profoundly moving and uplifting. "Impossible to pigeon-hole...breath-taking beauty...her rich voice effortlessly opens the listeners' hearts." Stroud News & Journal.